The very, very wealthy have a veneer of perfection, yet rarely is that the case. For those planning to spend some time laying by the pool as the weather heats up, we have found your go-to book this season. Social Death, a gripping mystery by Tatiana Boncompagni, is a true page-turner. The murder scene of a New York socialite happens on the Upper East Side, with no clues except the knowledge of her dying while trying to reveal a scandalous secret. Veteran news producer Clyde Shaw checks out the scene and realizes the murder victim is the daughter of her boss… and her best friend. Throughout solving the case, Clyde’s past catches up with her and she has to make haunting decisions between her job, reputation, and life. With secrets and millions at stake, you won’t want to put down the book until you unlock Clyde’s fortune. Sound enticing? It is…. If you are familiar with Tatiana Boncompagni’s previous work like our favorites, Hedge Fund Wives and Gilding Lily, you know her glimpse into the world of the rich and famous is utterly contagious. 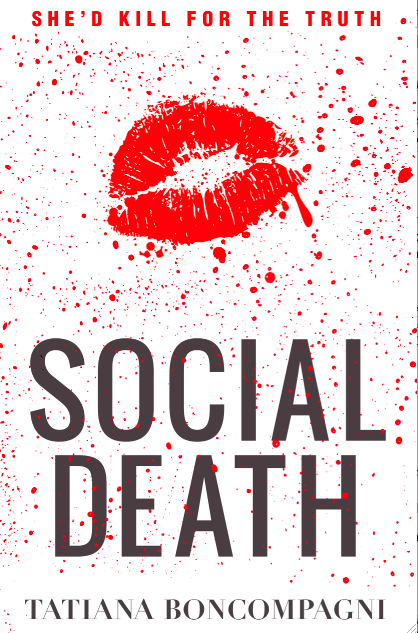 With Social Deaths; release, beauty company Votre Vu has also created a red lipstick referencing the book’s title, setting, and graphic cover image. How chic is that? Votre Vu’s newest shade of lipstick is an incredibly wearable red that captures the book’s drama and style. Boncompagni’s love for red lipstick, a symbol of intrigue, glamour and seduction, is exactly what her novel is about. Wear it in good health; it is handcrafted with pure plant waxes and vitamin E, the cleanest formulations to protect your gorgeous grin. So pucker up, ladies and you can learn more about her at www.boncompagni.net or visit any Barnes and Noble store or Amazon.com to buy Social Death. It is also available on Amazon.com. We’ll leave you with a little insight…the rich are different from you and me. They have deadlier secrets.